Kodak are the latest company to revive and polish up an iconic piece of logo design. To coincide with their return to the consumer products market, Kodak have polished off their iconic camera-shutter logo design and waved goodbye to the rather uninspiring text based branding they introduced back in 2006. 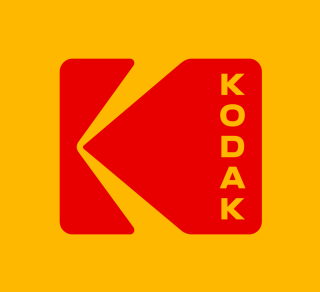 As well as featuring the instantly recognisable red and yellow colour scheme, this latest iteration of the Kodak logo also includes a new typeface and layout which calls to mind perforations found on the edges of old film stock. The idea of bringing back classic logos and branding appears to be a design trend at the moment, with the Co Op reviving their four leaf clover, and NatWest restoring a logo originally found in their design archives over the last few months alone. However Kodak's Chief Marketing Officer, Steven Overman, emphasises that the new design by Work-Order isn't a step backwards. “I don’t think of what we’re doing as ‘bringing back’ the iconic identity of Kodak, because in people’s hearts and minds, I don’t think it really went away," he explains. "It’s simply logical to keep one of the world’s most famous brand marks at the forefront of the company’s image and identity.